I haven’t given enough thought to this but, among the blogs I read and wander past, there seems to be a generational effect at work and it freaks me out. I’m not presuming an exact genetic link, where I gave “birth” to blogs that came after mine. I’m referring to timing. Chris Lehmann’s Practical Theory, for instance, was the first edublog I read. His blog motivated me to turn a private blog public. Jackie Ballarini was one of my earliest commenters who eventually set out to do her own thing. A year after Jackie Ballarini you had Kate Nowak, one of Jackie’s readers, now submitting fine work at f(t). A year after Kate Nowak you have Elissa Miller writing up the new teacher experience at Miss Calculate. It’s a process that boggles me a little bit, that makes me want to break out into song a little bit, that I recommend wholeheartedly to new teachers who now have the luxury of selecting mentors from all around the world. Who were you reading before you started blogging? Where were you commenting? How did you get into this? I’m especially curious of people upstream like Chris Lehmann and Christian Long and that Dangerously Irrelevant guy, all of whom basically predate the Internet in my head. Does this place ever seem to you like Lost island? I swear, sometimes I click around and become aware of an entire other side to this place, blogs that link to none of the blogs I read and vice versa. Bud Hunt has written this one up but he doesn’t explain how any of us ended up on this side of the island or, more importantly, what the four-toed statute means! The last few weeks have been pretty profoundly discouraging on all three of my professional fronts. I’m sure it’s just the ebb tide of education but it’s worth mentioning that I’m specifically losing my mind over this WCYDWT thing, which is just a thing and may be much less than that, some form of digital wankery, I don’t know. It’s like when you were a kid and you whispered the word “football” over and over again until the compound word separated and both parts seemed weird and meaningless all at once, that’s something like giving three conference sessions on the same process of curriculum design in four months. I can’t convince my fellow curriculum specialists at Google nor the teaching cohort I mentor online nor my high school colleagues of its value, which makes convincing myself of its value suddenly a real trick. I’ll say this much for certain: if there’s value here it isn’t in the comment, “Rates! We could talk about rates!” The response to these media too often breaks down into a checklist of mathematical conversation starters and if you’re going to offer them any more than two minutes of class time then they absolutely have to be more than that. They have to earn their keep. What do the students do with the photo? What questions will they ask? What measurements will they need? Once they’ve resolved the first question and feel like they have a stronger grip on the concept than they really do, how will you twist the scenario around to challenge them? How will you create that crisis? Maybe it’d be better if I showed all of my cards up front, rather than this coy unveiling process which seems like a non-starter. If the exercise interests you, help me construct a narrative, an activity around these photos. Extra credit if you feel like contrasting it against Sean Sweeney’s pass at the same material some months ago. that they don’t really get why they’re being asked to do it in the first place. I have become convinced, overwhelmingly, that my value to my students as an educator is bound up less in what I know (though knowing things doesn’t hurt) than in my ability to engineer a safe, controlled crisis in their learning process (which, I think, requires knowing a whole lot about something very little). Blum-Smith’s post connects a lot of my recent disconnected writing — in particular, my intention to be less helpful and my interest in a learning process that positions new knowledge as the solution to the limitations of old knowledge. 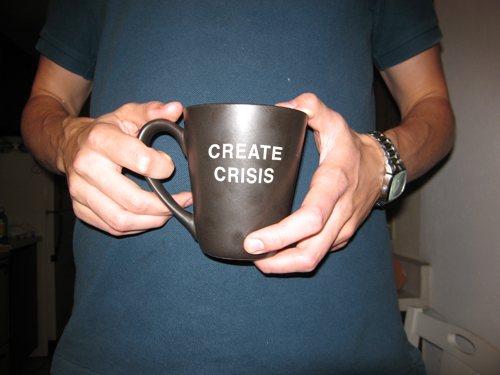 As far as teacher mug slogans go, “create crisis” should start some good conversation in the faculty lounge. Let’s set aside the fact that she uses “teacherly” as a pejorative. The applicability of this post to anyone who spends the majority of her work day asking students questions should be obvious. Furthermore, I haven’t set aside the puzzle I posted in You Have No Life. I’m ripping pages out of the playbooks of people who spend their working lives “engaging the imagination so that people don’t feel threatened by it”: Nina Simon (museums), Jane McGonigal (games), and David Milch (television, quoted). The projects highlighted at the Kickstarter blog (miscellaneous) are essential reading also. I’m not in the prognostication business. I draft off more serious thinkers on the open question of the effect of the Internet on higher education. I don’t know if I’ve missed a dumptruck-sized hole in Cringely’s reasoning but I found the piece extremely provocative and I’ll be revisiting it later in this space. I want to buy a coffee table book packed with anecdotes just like this one from Ian Garrovillas, illustrating the healthy, cool interaction between a student and teacher.